Welcome to the New Release post showcasing projects from Our Daily Bread Designs September Release! You can see all of the October Releases here. Continue reading below to find out how you can win one of three $15 Gift Certificates to the ODBD Store good towards the purchase of ODBD stamps. Today, I'm sharing two Christmas cards created with the new Noel Ornament stamp set, ODBD Custom Peaceful Poinsettias Dies and ODBD Custom Matting Circles Dies along with some additional ODBD Custom Dies, stamps and paper! I love to add layers to my projects and this card had plenty of them! The base is Hunter, to embellish the panels I added pattern paper from the ODBD Christmas Paper Collection 2013 to Vanilla card stock. I also added borders to the side panel using the ODBD Custom Beautiful Borders Dies. I embossed the Noel Ornament in Gold Detail on a scrap piece from this paper paper collection, die cutting the image with the ODBD Custom Circle Ornaments Die, layering a Vanilla die cut using the ODBD Custom Matting Circles Dies, then a Hunter panel that was die cut using the ODBD Custom Doily Dies. To embellish the ornament I die cut/embossed and stenciled the ODBD Custom Peaceful Poinsettias Die from the paper collection, scruched the flower for a 3D look, then added die cut leaves using the ODBD Custom Circle Ornaments Dies, Seam Binding and Zva Creative Crystal Gems. The ornament can easily be removed by the card recipient so they can hang it on their tree. 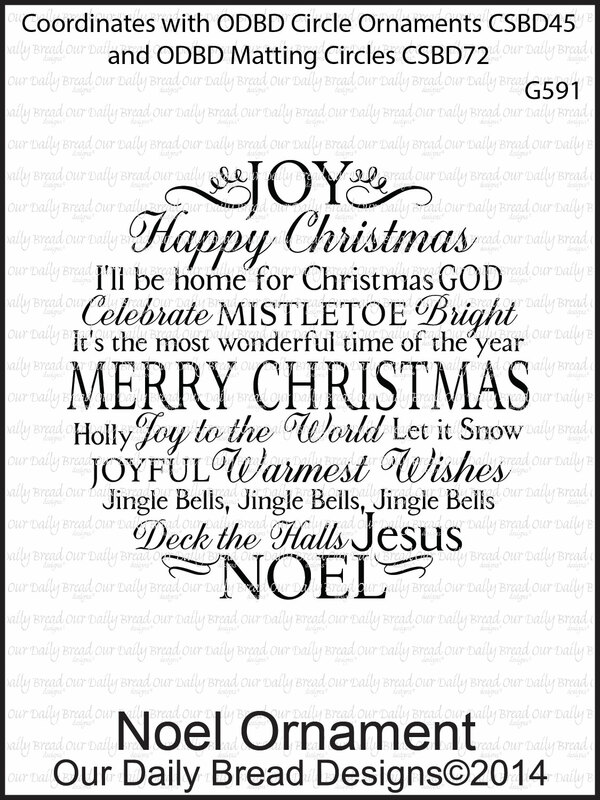 My next cards is a Clean and Layered Card using the ODBD Custom Peaceful Poinsettias Dies/Matting Circles Dies/Circle Ornaments Dies/Beautiful Borders Dies/Ornate Borders and Flower Dies, Noel Ornament and Christmas Door stamp set. To create the poinsettia, I Silver embossed the Noel Ornament on pattern paper, then die cut the ODBD Custom Peaceful Poinsettias Dies, die cutting two of the largest die for a fuller poinsettia. The poinsettia is layered on two circle panels die cut using the ODBD Custom Circle Ornaments Dies and ODBD Custom Matting Circles Dies. 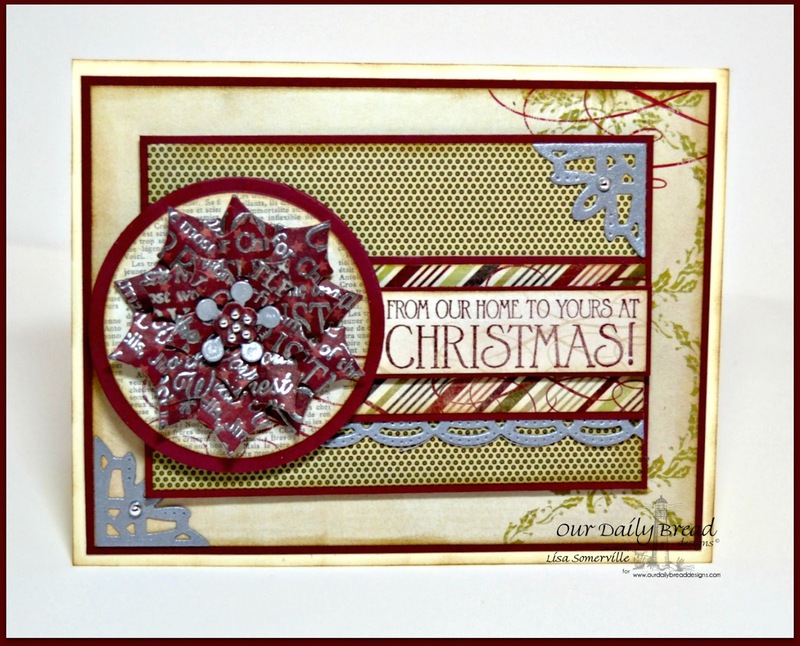 The sentiment is stamped in Burgundy using the Christmas Door stamp set. To embellish I added Silver die cuts using the ODBD Custom Beautiful Borders Dies and Ornate Borders and Flower Dies, along with Silver Gems. 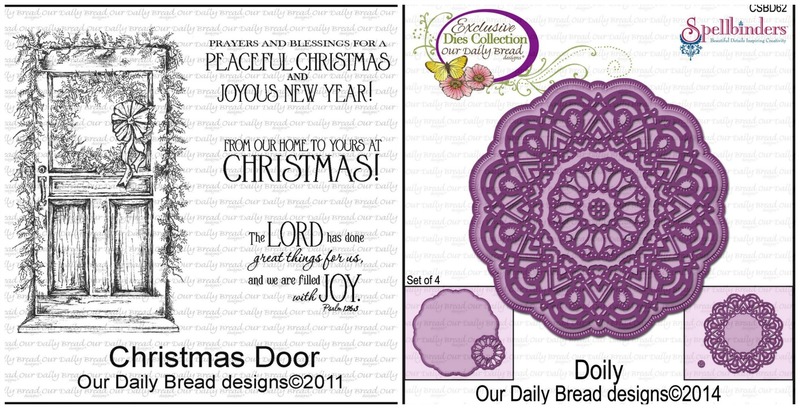 Three randomly selected winners will each receive a $15 gift certificate to Our Daily Bread Designs, good towards the purchase of ODBD stamps found in the "stamps column" of the ODBD Website, just for commenting on the Design Team cards! You have until Thursday, October 2, 2014 at 9:00 p.m. EDT to leave your comments. The Winners will be posted October 3rd, on Our Daily Bread Designs Blog, so be sure to check back there to see if you won! Girlfriend, I've said it before, but you are the QUEEN of fancy folds!!! Super gorgeous tri-fold and I LOVE how you silver embossed before cutting out the poinsettia on the 2nd.....wowza, that looks amazing!! HUGS!! A fabulous Tri-fold, Lisa! Love the poinsettia topping the ornament. So clever to stamp and emboss Noel then die cut! Hi Lisa!! Both cards are so gorgeous! Love how you did your poinsettias! Love your cards! Outstanding use of that poinsetta die. Beautiful! Beautiful cards! I really love the Tri-fold one! I have to say, Lisa, you are the queen of folds!! 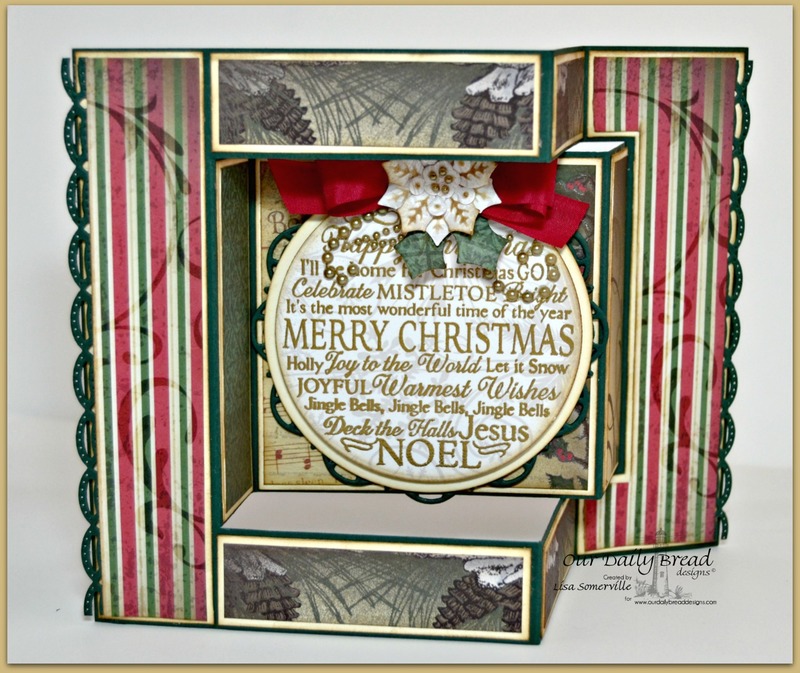 Love your use of paper and the ornament on your trifold!! The use of words on the poinsettia on your second is so creative!! Fabulous folded card.....it is wonderful!!!! Your second card has just the right balance...love it! Wonderful cards. Great choice of papers. I love your shaped cards, Lisa and this one is just gorgeous with the gold embossing and the beautiful DP! And how clever…your poinsettia is amazing! Fabulous release projects! Hugs! WOW! I love both cards!!! but I especially like how you did the poinsettia on the second card!!! Lisa, these cards are beautiful! Love the trifold with the new image and the beautiful poinsettia image on the second! Hi Lisa, What Gorgeous cards...wow!! Love them, especially the first with that shutter fold...so pretty!! I really like the vintage feel and depth of field you obtained on your first Christmas card with those folds! Very cool!! Your technique with the poinsettia turned out great too! It's very pretty! Lisa wow! I absolutely LOVE your tri-fold! I had a pattern for one of these out but you sure rocked it!!! Great use of papers and the ornament is a perfect fit for the center pop out! Love the poinsettia card too... love that you stamped the ornament words on the petals! Such a cool effect! Great samples! I really like your trifold card. Beautiful! Oh how I love the dies you used Lisa! And the paper choices... YUMMY! I do love the ornament (those phrases pop with your treatment...) I always enjoy your creations! Love you mixed and matched the CC papers! Looks great! The embossing on the poinsettia die cuts was very cool!! 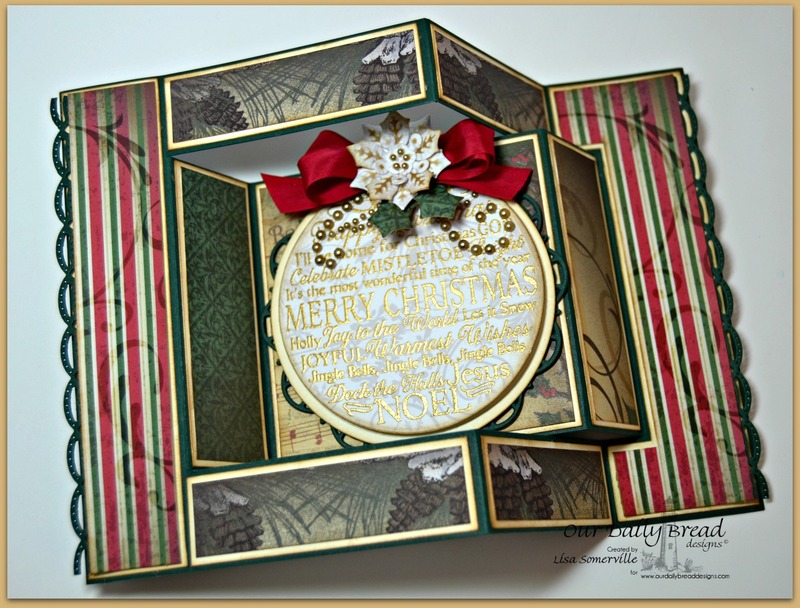 Fabulous tri fold card and the layered card using the dies is very beautiful! The ornament works perfectly with that shaped card, and very creative and pretty job on your flower, love the way you used the papers! Everything looks perfect together! I would love to be able to make a tri-fold like yours. These are so impressive! Thanks so much for sharing! Merry Christmas! Lisa, your projects are beautiful. Love the way you decorated the trifold card. I love the color/design combination on your second card with the pop of silver. OH, what a clever way to use the stamps on the tri-fold shutter card! Love it. Both of these are beautiful, Lisa! Great use of papers & dies on these & your silver/red poinsettia is so pretty.